I've checked out a few top ten lists around the blogosphere so I thought I needed to add my ten cents worth. I've divided them into three categories: Adult Fiction, YA Fiction and elementary fiction as these are the areas I do the most reading. I've grouped several series titles together as you'll notice. For example, I loved Stieg Larsson's Millenium series but can't give it three spots on my list. Also they are not in any particular order as to how much I enjoyed them-too difficult to pick an absolute winner. Links added are to my own review of each book.How many of these titles have you read? Tell me your thoughts. Enjoy! 1. Girl with the Dragon Tattoo series by Stieg Larsson-mystery, never reviewed it because so many others had but I'm a big fan of Lisbeth Salander, a kickin' heroine from Sweden. 2. Hotel on the Corner of Bitter and Sweet by Jamie Ford-Historical Fiction, alternating between 1942 and 1986, Asian-American, Internment Camps during WWII. 3. The Book Thief by Marcus Zusack-Historical Fiction, Nazi Germany, narrated by Death. Brilliant! 4. Serena by Ron Rash-Historical Fiction-North Carolina Mountains, environmental destruction amisdst ruthlessness. 5. The Sweetness at the Bottom of the Pie by Alan Bradley-1950, England, 11-year-old star heroine, Flavia solves great mystery. 6. The Girl Who Fell From the Sky by Heidi W. Durrow-interracial story of Rachel's family, told in alternating chapters, 1980's. 7. The Particular Sadness of Lemon Cake by Aimee Bender-present day quirky family, Rose can taste her mother's feelings through her cooking. 8. Buying Time by Pamela Samuels Young-Diverse, mystery, loved the layers and interconnecting of many characters. 9. Still Alice by Lisa Genova-Harvard professor with Alzheimer's disease, amazing in-depth story, had me in tears. 10. The Lacuna by Barbara Kingsolver Historical Fiction-just finishing this but am amazed by the research and layered history of this tale. 1. Habibi by Naomi Shihab Nye-Emigration tale from America to Palestine. 2. The $66 Summer by JohnArmistead- Historical Fiction, Alabama, 1950's. 3. Wildwood Dancing by Juliet Marillier-Fantasy,beautiful fairy tale with shades of the 12 Dancing Princesses. 4. Restoring Harmony by Joelle Anthony-Dystopian world, Canada and U.S., 2031, Anthony creates a unique world of the future. 5. Shiver/Linger by Maggie Stiefvater-Fantasy, werewolves, love story, excellent writing. 6. Forge by Laurie Halse Anderson-Historical Fiction, Revolutionary War and Slavery. 7. Along for the Ride by Sarah Dessen-Realistic Fiction, smart girl meets beach boy=complicated romance. 8. Just Listen by Sarah Dessen-Realistic Fiction, Owen helps Annabel understand the complicated parts of her life. 9. 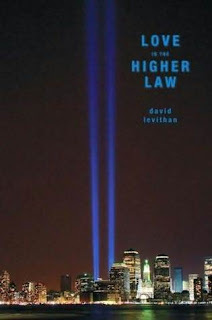 Love is the Higher Law by David Levithan-September 9, 2001, teens deal with fall-out before, during and after the towers fall. Heavy, timely and funny. 10. Devil on my Heels by Joyce McDonald-Historical Fiction, 1950's, racial strife in Florida, great rabble rousing. 1. Yankee Girl by Mary Ann Rodman-Historical fiction, Civil Rights Strife, tear-jerker. 2. Love, Aubrey by Suzanne LaFleur-Realistic Fiction involving death of sibling and parent, fantastic writing. 3. Any Which Wall by Laurel Snyder-Fantasy, children in Iowa small town discover a magic wall which makes for great adventure over the summer while the rest of us are just out riding our bikes. 4. Fablehaven series by Brandon Mull-Fantasy, amazing world surrounding grandparent's house. 5. One Crazy Summer by Rita William- Garcia-1968 Historical Fiction, Black Panthers. 6. When You Reach Me by Rebecca Stead-A Wrinkle in Time mixed with realistic fiction, NYC drama. 7. Clementine; Friend of the Week by Sarah Pennypacker-You can make a mess of things and your friends will stand be there for you. 8. Where the Mountain Meets the Moon by Grace Lin-Fable/Asian tales, girl and dragon change their destiny. 9. The Night Fairy by Laura Amy Schlitz-Fantasy, night fairy battles elements in human backyard after bat chews her wings. 10. Star in the Forest by Laura Resau-Realistic Fiction, Mexican family deals with deportation, difficulties as daughter takes care of abandoned dog to ease pain. I hope each and everyone of you had a very Happy New Year! Cheers to 2011.